I forgot there were rules, other than posting something with the next letter. Just don't let it happen again. Or else. Peace is something really good, which should be a fact always. Roosters wake up their owners early in the morning. Sadly, they don't know about daylight savings time. The colder the weather is, the more clothes I put on in order to get warm. Very warm clothing can be bulky. "Would you rather" questions, and answers to them, are fun and interesting. Yogurt is tasty, Honey is tastier and Chocolate is even tastier. Zoodles Oodles! I agree with that ranking! 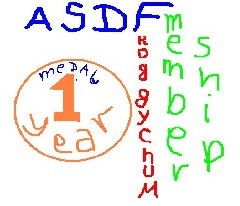 ASDF is the only cool forum amongst all forums I have ever seen on the Internet. Edit - Now I know that there is one more cool forum - the Crunchyroll forum is also very cool. Last edited by Ivokyuftaf6666 on Sun Dec 23, 2018 1:50 pm, edited 1 time in total.